Thursday, July 14th @ 7:30pm @ Firewater Grille (on their patio) 26108 Overlook Pkwy - San Antonio, TX Cost is $15 (includes 5 wines and appetizers) We will be introducing our brand new Vinously Speaking Wine Blog Men's & Women's Shirts for y'all to purchase! Yeehaw! So bring some extra cash or your checkbook. The shirts will run anywhere from $15-25 depending on the shirt/design. Hope you will join us for some fabulous social wine education - a time to mingle, learn about and enjoy different wines and food pairings, enjoy live music, and discover a new vinous spot in San Antonio! Be sure to RSVP on our Facebook event page and please invite any and all wine drinkers you know! Thursday will be a milestone for Vinously Speaking! Vinously Speaking’s “Social Wine Education” Events !!! Extra Info – We will be introducing our brand new Vinously Speaking Wine Blog Men’s & Women’s Shirts for y’all to purchase! Yeehaw! So bring some extra cash or your checkbook. The shirts will run anywhere from $15-25 depending on the shirt/design. Hope you will join us for some fabulous social wine education – a time to mingle, learn about and enjoy different wines and food pairings, enjoy live music, and discover a new vinous spot in San Antonio! Be sure to RSVP on our Facebook event page here and please invite any and all wine drinkers you know! Now, you know I wouldn’t leave this post hanging like that, so here is little sneak peak of the location we are starting these “Social Wine Education” events at … Firewater Grille :) My co-blogger Melissa Unsell and I went to scope out this joint about a month ago and boy were we were given the VIP treatment! We were helped out by the restaurant manager, Jesse Sosa. 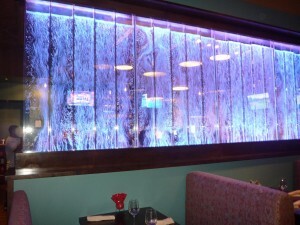 On a side note, isn’t the bubble wall neat! And it changes colors! So Jesse talked to us about the restaurant’s opening and about their five months in business. Firewater Grill may have recently opened, but they have brought in quite a crowd and are already offering some great deals for their clientele. For example, they offer half off their appetizers for happy hour from 5-7pm and then they offer a reverse happy hour from 9pm to close with various drink specials. Additionally on Wednesdays and Sundays they offer 40% off all of their wine bottles!! Now that is a vinous deal! They also have a ginormous screen on their patio to play all those sport games and matches you want to watch. They also offer live music on their patio later in the week and on weekends. And another vinous offering they have is Tuesday Wine Tasting Events! $15 will get you some of Firewater Grille’s Delicious Appetizers and a Chance to Taste some New Exciting Wines … just like our event on Thursday! After our chat, Jesse told us to pick out whatever we wanted to try on the menu and then we would do a little wine tasting … he had to twist our arms! Melissa and I decided to try a few of the appetizers so that we could taste a variety of things with out filling ourselves up too much :P The second I opened the menu I was instantly drawn to one of my favorite guilty pleasure foods … fried pickles!! And they have to be sliced pickles, I can’t do fried pickle spears, I have standards. Lol. May the dear Lord bless the person who went into their cupboard on late evening and said, “All I have in here is flour, pickles, spices and oil … guess I can try to fry the pickles!” Also, Melissa had never had fried pickles before, so this item was a MUST! 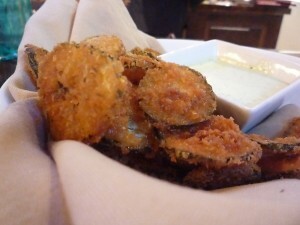 These Fried Pickles are house brined cucumbers in a cracker batter crust served with with Firewater ranch dipping sauce! Verdict … Melissa loved ’em. Sadly this is a food item you can’t have too often or else your hips will pay :( Pickles are veggies though right ? :P And with pretty much any fried food … go with a bubbly option or a white wine with some crisp acidity to cut through the ‘grease’ and cleanse you palate. Next on our appetizer sampling were the MARYLAND CRAB CAKES! 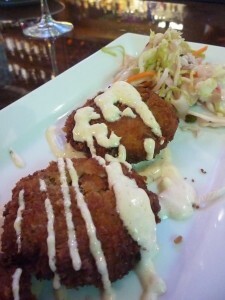 (Lump crab cakes with cabbage, capers, and herb slaw over zydeco sauce) ~ YEEEHHAW these were yummy! I mean you really can’t go wrong with crabcakes, but there were delightful and had the perfect amount of spice to them! Last on our appetizer journey was a dish called CHILES WILDE, aka mild Anaheim pepper stuffed with goat cheese and bacon wrapped shrimp …. ooooh! These were my version of the perfect dessert :) … in case you didn’t know this about me, but I am really not a dessert/sweets kinda person, I’m the savory type. “The Brain” – This varietal is generally aged in stainless steel and no oak, to retain the wine’s freshness and fruitness and is generally dry, medium bodied, upbeat fruit and floral, with good acidity and a crisp finish and shares similar varietal characteristics to the french grape Viognier of being one of the more aromatic and perfumed white grape varietals (along with Albarino and Muscat varietals). “The Nose” – tropical fruits (passion fruit), citrus fruits, herbaceous notes. “The Brain” – Founded in 1974, this was was the first New Zealand winery to produce Sauvignon Blanc, establishing it as an innovator and pioneer of New Zealand viticultre. They grow all of the main French grape varietals. “The Brain” – this wine is made by one of the largest and best-known wine merchants in France with the nicknames of le roi du Beaujolais (the king of Beaujolais) or sometimes pape du Beaujolais (pope of Beaujolais). Want to know which wines I am talking about and taste a few more? 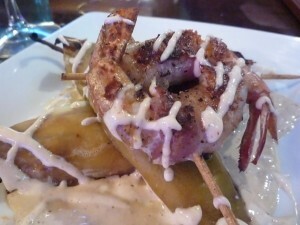 Want to discover this new restaurant in San Antonio? Then COME ON OUT AND JOIN US for the inaugural event for Vinously Speaking’s “Social Wine Education Events” !! !